BRIEF OVERVIEW: Small surf expected for the weekend. New SSW swell starts to provide building surf later in the day on Sunday. Decent weather/wind conditions expected. 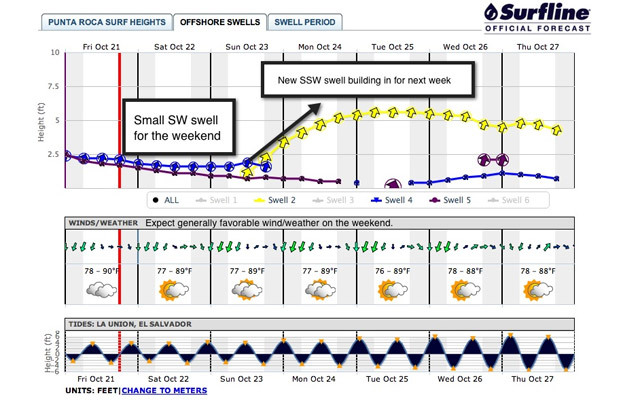 NOTE – Solid SSW groundswell due for next week! SWELL/SURF: Mainly a small/easing SW groundswell (215-205 deg) mixed with minimal SW windswell. Look for mostly knee-waist high surf (2-3′) with inconsistent waves/peaks still pushing up to belly-chest high during the better tides. WEATHER/WIND: Light offshore NNE’erly wind in the morning, with a light+ SSW-SW seabreeze for the afternoon. Possible evening glassoff. Partly to mostly cloudy skies. Chance for passing rain showers and thunderstorms. SWELL/SURF: Old/small SW swell will linger through the day as the long period forerunner traces of a new SSW swell (205-195 deg) creep in through the morning. The new SSW energy will start to build more quickly through the afternoon/evening. Surf through the morning will generally hang in the knee-waist high zone (2-3′). Then expect building surf over the afternoon with sets getting up to chest-shoulder high (3-4′). Possible slightly bigger waves showing before dark.